For his eighth appearance, closing the 26th season of the Frederick Collection’s Historical Piano Concerts series, Stephen Porter chose to play his recital on the Collection’s 1877 Blüthner. Julius Blüthner (1824-1910) opened his factory in Leipzig in 1853, a capital year in the history of piano building; Carl Bechstein also opened his factory in Berlin, and Henry Steinway opened his in New York City. Some composers were especially attracted to the Blüthner sound. A notable one was Debussy, who first encountered the make on a holiday trip to the Isle of Jersey in 1903. He purchased a 1904 model in 1905; the Frederick Collection includes a similar model from 1907 that has occasionally appeared on the series and been used for recordings, including one of the complete Préludes which Debussy composed on and for his Blüthner, with its sound in mind. In spite of his virulent anti-German feelings inspired by the invasion of France at the outbreak of WW I — he attempted to enlist, but was rejected due to his age and health —when he died of cancer in 1918, his Blüthner was still in his studio. Similarly, Rachmaninoff brought his beloved Blüthner with him when he emigrated to the U.S. that year. Porter chose to close the first half of his program with Debussy’s L’Isle joyeuse, inspired by the 18th-century painting by Antoine Watteau, L’Embarquement pour Cythère, and composed in 1904 after he had encountered a Blüthner but before he acquired his own. Although published as a single piece, Australian pianist and Debussy scholar Roy Howat posits, it was intended to be the concluding segment, following Masques and D’un cahier d’esquisses, of a second Suite bergamasque, but that the composer relented to periodical publishers’ demands for single works for issues of their journals and allowed them to be published separately, and then never published them as a set. The three works appear on a recording by Duke University faculty member Randall Love that uses the Collection’s aforementioned 1907 Blüthner. In the first half of the program were works by two Norwegian composers, Christian Sinding and Edvard Grieg, both of whom studied at the conservatory in Leipzig (1874-78 and 1858-62, respectively); Ignaz Moscheles, its director 1847-70, was a close personal friend of Julius Blüthner and a Blüthner artist), where they undoubtedly encountered Blüthners. Both ultimately settled in Oslo. We heard the former’s best known piano work: Frühlingsrauschen (“Rustles of Spring)”, Op. 32/3, dating from 1896. By Grieg, we heard three of his Lyric Pieces (66 in 10 Books): Melodie, from Book 4, Op. 47/3 (1885-88), Scherzo, from Book 5, Op. 54/5 (1891), and Gade (named for the composer Niels Gade, with whom Grieg worked in Copenhagen after leaving the Leipzig Conservatory), from Book 6, Op. 57/2, (1893). All of these works are considerably more recent than the instrument, which nonetheless suits them well; Porter played them all, as well as the Debussy, from memory and exuberantly, fully exploiting the piano’s glorious sound, whose notes remain distinct within the waves of ringing, thanks to Porter’s judicious pedaling. Scherzo and Gade in particular allowed him to show off the possibilities of the various registers of the instrument. The balance of the first half was devoted to three (Nos. 1, “Villanelle”; 2, “Le Spectre de la rose”; and 6, “L’Île inconnue”) of the six numbers of Hector Berlioz’ Les Nuits d’été, Op. 7, dating from 1840-41, rev. 1843 and 1856, and orchestrated 1856, in its original version for mezzo soprano and piano, with Krista River as soloist. We usually hear the orchestral version, and it is by far the most frequently recorded; indeed, of the 44 recordings currently available at Arkiv Music, the only one with piano accompaniment that is readily obtainable is the 1989 one I own by Belgian baritone José Van Dam and Jean-Phillipe Collard (Van Dam also recorded the orchestral version). This may well startle readers, since it is scored for and usually sung by a mezzo, but it is, in fact, more logical because the speaker of the Théophile Gautier (1811-1872) poems is a male. Berlioz was anything but a logical and practical composer…; to wit: when he executed the orchestral transcriptions, he transposed some of the vocal lines and specified the voices for each song (with choices for some) including contralto or tenor as well, so a re-transposition is necessary for the cycle to be performed by a single soloist! The poems come from Gautier’s 1838 collection La Comédie de la Mort, but this is misleading, because the collection takes its title from its opening 46-page work, while the remainder of the book’s 212 pages are much shorter “Poésies diverses“ (Miscellaneous Verses), some of which were published previously in journals, and some of which (including some that Berlioz chose – Nos. 1 and 3 of Les Nuits) had been set to music by others. It is from these poems that the six texts are chosen, in order of their appearance except for the first which comes after the other five, although only two pairs (Nos. 2 and 3 and also 4 and 5) appear consecutively; Berlioz changed the titles of four (Nos. 1, 3, 5 and 6), although not their texts. They are interrelated, with themes of love, loss, separation, death, and joint escape, but do not tell a continuous story. What is lost of the profuse lushness of the orchestral version is gained in the discreet intimacy of the original piano accompaniment, which is described in Gérard Condé’s notes accompanying the CD as “an orchestration in black and white” (my translation) because of its creativity and originality. Readers might be interested to know that both Gautier and Berlioz were esteemed and frequently published music critics/reviewers, although the former (much like me) had no formal musical training; he was merely an avid serious listener and insatiable music lover, un mélomane, en français, term that more accurately characterizes the affliction than its English equivalent!.. Oddly however, he seems never to have heard a performance of Les Nuits d’été, although he reviewed some of Berlioz’ major works, including Roméo et Juliette, Benvenuto Cellini, La Damnation de Faust, and L’ Enfance du Christ. I am admittedly a difficult lisontener to please with this work, my favorite cycle in the French mélodie repertoire, a genre which Berlioz created with this, its first true cycle, some earlier individual songs, and his two prior collections, Huit Scènes de Faust (Goethe settings in French translations by poet Gérard de Nerval), Op. 1 of 1828 (later incorporated into La Damnation de Faust), and Irlande; 9 Mélodies pour une ou deux voix avec Choeur, Op. 2, composed in 1829, published as simply Irlande in 1830, re-published under this title in 1850, and commonly known as Mélodies irlandaises – he loved re-working his pieces! Indeed, it seems that the term mélodie came to be the French equivalent of lieder from this usage/title; they are re-workings of Irish songs by Thomas Moore in French translations by Thomas Gounet, and Berlioz was merely using the French equivalent of Moore’s term for his works. I own nearly a dozen recordings of Les Nuits d’été and am a speaker of French with native fluency. This performance was fine: River’s diction was impeccable and she exhibited sensitive vocal and gestural expression, but Porter did not exercise quite enough restraint and overpowered her at times, creating an uneven balance and keeping it from being truly ravishing. The piano has a certain haunting quality that served Le Spectre de la Rose well, which should also work well for No. 4, L’Absence, not performed. The second half of the program was devoted entirely to Grieg’s song cycle Haugtussa (“The Mountain Maid”), Op. 67 (1895, pub. 1898), again with River. Although Grieg considered this his best song cycle, it, unlike the Berlioz, is rarely performed live and not even frequently recorded: I find only 11 at Arkiv Music, and own the 1993 award-winning one by Anne Sophie von Otter and Bengt Forsberg, which I highly recommend. Grieg composed nearly all his lieder for his wife (and cousin) Nina Hagerup, who reputedly had a lovely soprano voice, but not an operatic singing style: according to Finn Benestad’s CD notes, it was characterized by her contemporary Danish baritone Julius Steenberg as “an animated dramatic recitative.” This suited Grieg perfectly, because he felt, as he wrote to his biographer Henry T. Finck, that the purpose of musical accompaniment for a poem was “to allow the text to speak […] in a heightened manner,” and that music which did not accomplish this was a failure. The cycle sets eight of the 70 poems in the 1895 collection of the same title by Arne Garborg; sketches were made for six more, but they remained incomplete at Grieg’s death in 1907. The songs alternate between the subjects of love (odd numbers) and nature (even numbers) and do have something of a continuous story line involving the shepherdess’s unrequited love. One cannot help but compare this nearly half-hour gem with its Schubertian equivalent (albeit with twenty numbers and twice as long), Die Schöne Mülerrin, and wonder why it is so infrequently performed and recorded in comparison. Its concluding number imitates the babbling brook that is its subject, and which its female speaker is addressing, equally well, perhaps even better fitting it to the text itself. River seemed a bit more at home in this work; she had the score on her stand but never really consulted it. She sang a couple of the numbers slightly more legato than von Otter and used somewhat less dramatic expressive extremes, but all was equally appropriate and satisfying. Her diction was impeccable here, too, and Porter matched her volume better for a perfect balance. This piano is perfect for this music; the performance was simply stunning. They should record this work and the complete Nuits with this instrument, retaining the Sinding and the Debussy in opening and central positions and finding a single appropriate solo piano piece, perhaps by a different composer, as a closer; it would make a ‘knockout’ recording! 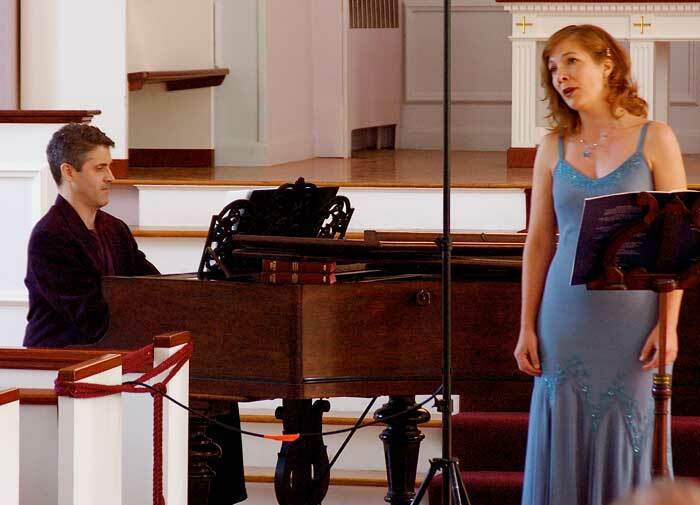 The musicians favored us with an encore: the recitative and aria “Ombra mai fù,” from George Frideric Handel’s Serse, in which River will be performing the title role with Arcadia Players Baroque Orchestra on June 25 in Northampton’s Academy of Music. A comment is warranted concerning the thoughtful craft and clever brilliance of the recital’s programming, opening with rustling leaves and closing with a babbling brook, and having the final Berlioz song followed by the Debussy, for example, and that same song link the other piano pieces on the first half and the song cycle on the second, since its text refers to Norway as a potential destination for the lovers on their imaginary romantic voyage to the unknown isle (whose original title by Gautier was simply “Barcarolle”). The instrument in this concert, serial number 12960, with a keyboard compass of seven octaves, is 8’, 10” long, and had an additional feature invented and patented by Blüthner in 1872 called the Aliquot System, presently dismantled, alas. It consists of a set of strings mounted above those struck by the hammers in the upper registers which sound in sympathetic vibration with the latter in forte playing to provide an additional depth to the ring that is particularly enchanting in Impressionist music. Also, the cross-strung strings are not the lowest bass ones, but rather those of the upper base. Blüthners have a very distinctive ring that is warm, strong, and sustained, often recognizable to the ear without advance knowledge of the make of the instrument being played. I own a 2005 recording of Schubert’s Sonatas D. 664 and D. 960 performed by Viennese pianist Florian Krumpöck (a Blüthner artist – the firm has exclusive ones just as Steinway [Porter is one] and Bösendorfer do) on a modern Blüthner that has an absolutely amazing sound, unauthentic though it be. Thanks, Marvin, for an informative review. I just wanted to weigh in on the Grieg Haugtussa cycle. I completely agree it deserves to be far better known, but I understand why it isn’t. I’ve loved the cycle since I bought Kirsten Flagstad & Edwin McArthur’s LP of it (c. 1980), and finally had the pleasure of performing it last summer with a fine mezzo. This singer has some Norwegian ancestry but doesn’t speak the language. She has formidable intelligence and is a hard worker, but in the end she was dissatisfied with her performance, largely because the quasi-unfamiliar language wasn’t always firm in her memory and she felt she mangled some of the text. Since there were almost certainly no Norwegian speakers in the audience, our listeners reveled in the beauty of the music and were none the wiser about the text. My personal feeling is that it should only be done in the original (it is not infrequently done in German) even if a few “warts” result, because the sound of Norwegian is so integral to the songs’ affect. But I am well aware that the undertaking of “exotic” languages such as the Nordic ones is a major challenge on top of all the other memorization work a singer does. This, I feel, is the major reason for this cycle’s continuing relative rarity on recital programs. The songs of Die Schöne Müllerin, by contrast, are in a more widely spoken language, and some have attained a widespread popularity akin to that of folksongs. There are quite a few recordings of Haugtussa listed on Amazon.com, though, for those who want to hear it. The von Otter/Forsberg recording you cite is probably the high-water mark for current recordings, but the legendary Flagstad/McArthur one makes a wonderful alternate version albeit in 1950s sound.